BRUSSELS (AP) -- The European Union set up a high-stakes battle with Italy, one of the bloc's biggest economies, over who has final control over a member state's budget after the executive Commission took the unprecedented step of ordering the country to revise its public spending plans. In a move that escalates a monthlong standoff, the EU said the populist government's budget for next year is out of line and breaks earlier promises to lower public debt. Italy's debt load is the second-highest in Europe, after Greece, and there are worries that losing control of spending could rekindle financial turmoil in Europe. The populist Italian government says the sharp increase in spending is needed to jumpstart growth after years of malaise. "We see no alternative but to request the Italian government to revise its draft budgetary plan," EU Commission Vice President Valdis Dombrovskis said. Italian Deputy Prime Minister Matteo Salvini was quick to warn the EU to keep its hands off. "No one will take one euro from this budget." The confrontation laid bare the fundamental problem within the eurozone where 19 EU nations share the same currency, yet governments maintain autonomy over spending priorities and the EU has been reluctant to enforce spending limits. Since the euro economy can be destabilized when one member state loses control of its finances, like Greece did a decade ago, the other nations want to have some say over excessive spending, especially when it concerns the region's third-biggest economy. The EU Commission said it had no choice after Italy proposed a deficit of 2.4 percent of GDP for next year — three times more than what it had previously targeted. The higher deficit means Italy would not fulfil its promise to lower its debt, which is over 130 percent of GDP and more than twice the EU limit of 60 percent. Without a tough stance on the issue, the EU could see its credibility erode and markets could lose confidence in its ability to keep public spending in check. The Commission wrote in its official opinion that "given the size of the Italian economy within the euro area, the choice of the government to increase the budget deficit ... creates risks of negative spill-overs for the other euro area member states." EU Financial Affairs Commissioner Pierre Moscovici highlighted how Italy's budget would hurt its own people by saddling the young with higher debt payments. The cost of servicing Italian public debt is already equal to the country's entire spending on education — 65 billion euros a year. "Italy must continue its effort to lower its debt because it is the enemy of the economy," he said. The EU said it had already been lenient enough with Italy in recent years, giving it 30 billion euros ($34 billion) worth of wiggle room in its spending plans, as well as investment funds. The EU's executive wants the Italian government to produce a new budget proposal within three weeks. Italy argues the spending increase is needed to get growth going and fulfil electoral promises. The extra money will be spent on restoring pensions to as many as 400,000 people whose retirement age had been pushed back and on a basic income for some job-seekers. "We know that we are the last line of defense for social rights of Italians. And for this we won't let you down. We know that if we would give up, that the experts for the banks and austerity would return. So we will not give up," Deputy Premier Luigi Di Maio wrote on Facebook. The hard-line stance of the two populist leaders, Di Maio and Salvini, to some degree defies a more conciliatory position by the country's economy minister, who signaled in his response to Brussels that Italy would be willing to change plans if it didn't achieve the desired results. But both populist leaders also have something to gain with their voter base by leveraging a confrontation with the EU, which has been seen as the bogeyman requiring austerity cuts in recent years. 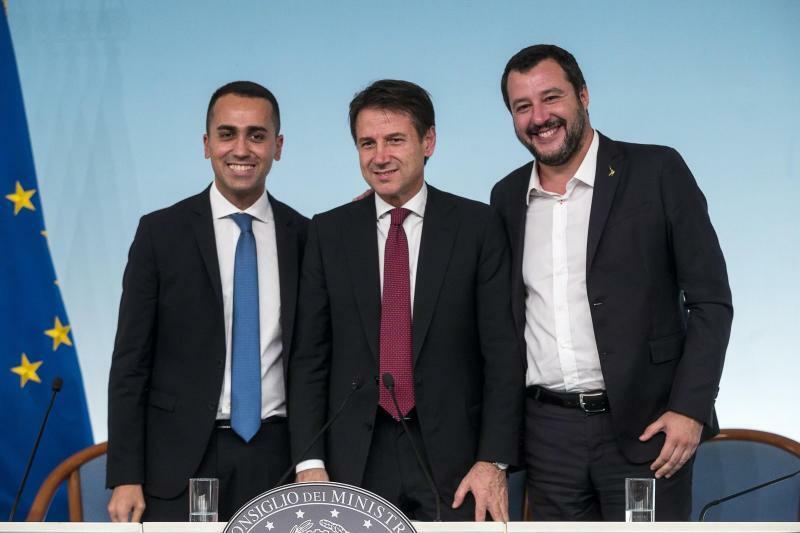 European parliament elections loom in the spring and Di Maio and Salvini are jostling to gain influence before then. Markets were quick to punish Italy over the dispute, with the government's cost of borrowing on international bond markets rising and the Milan stock market falling 1 percent. Italy's standoff with Brussels has had its first impact on corporate Italy, with credit rating's agency Moody's downgrading a slew of companies and banks just days after lowering Italy one notch to just one level above junk status. Those hit include state-controlled Eni oil company, the Italian Post Office, defense contractor Leonardo and 12 banks. Eni, which is 30-percent government-owned, said in a statement that the action was taken despite "favorable prospects for the company and the expectation of strong credit metrics."